It all began with a Facebook post by Guru where they were giving away some free samples. I then contacted them for a free sample and provided my address for delivery. I mentioned that I would like to review the sample on my youtube channel. 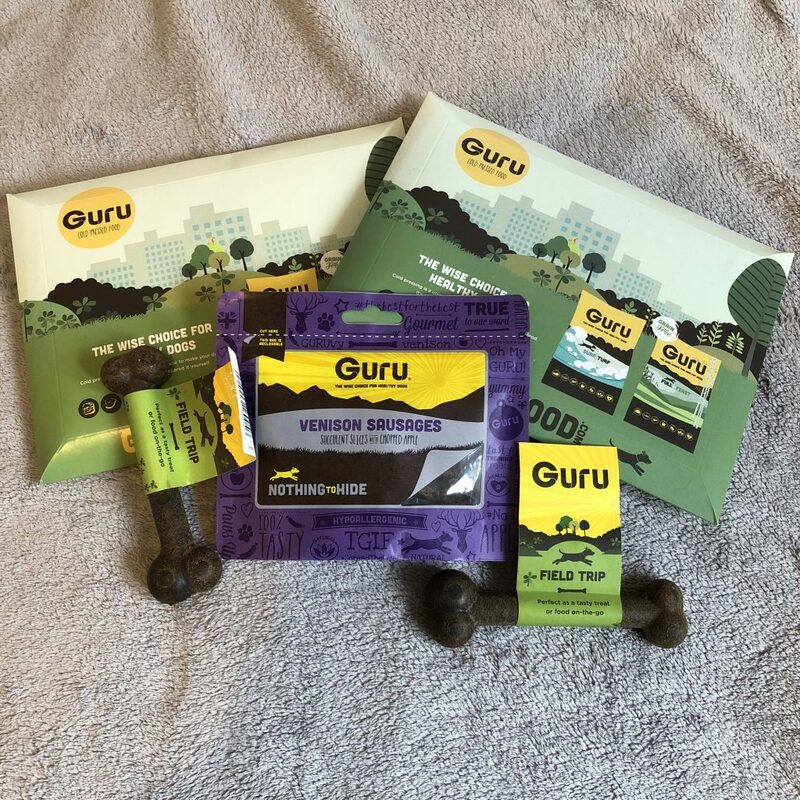 The next day I received a message from Guru explaining they would like to send Pixie and Roxy a "gurulicious" package to taste test on my social media, I thought that's great because I can review the different flavours and see what they like the most with the potential of changing to this brand if all went well. We all know how fussy Pixie and Roxy can be as we have been through over nineteen brands of food in the last 4 years. The food we are currently on (AATU) is great but I always said if I see one that may be even better then I would want them to be on that if its better for their health. It has got to the stage recently where they are being a little fussy again Pixie in particular and she isn't eating her meals the same. This is not ok when she makes herself sick because she is hungry and has an empty stomach but still refuses to eat. 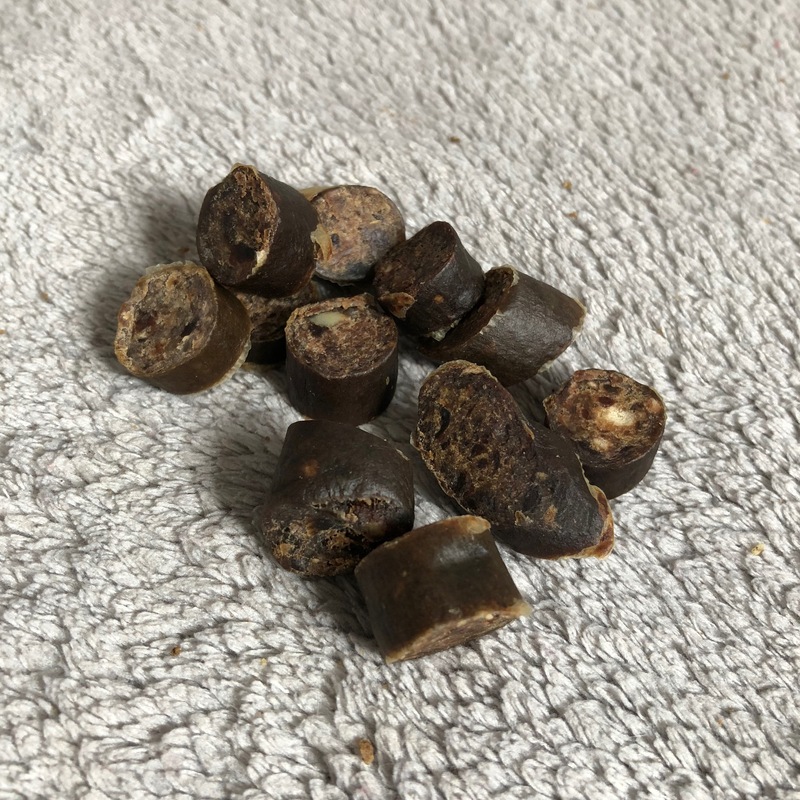 So with saying that let's see if Guru pass Pixie and Roxy approval, although I think it may need more than just a sample bag to see if it passes the test, let's see how excited they get. To my surprise, I received the package the next day! but nearer teatime. They had just had their dinner and I thought they would be too full to do the review at this time so I left it for the next day. I did open the box just because I couldn't help myself with having a sneak peek and to my surprise it wasn't just the two flavours of food in the box but two delicious looking bones wrapped in bubble wrap and a package of venison sausages! I wanted to get pictures of them before I open them or should I say before Pixie and Roxy made me rip them open. 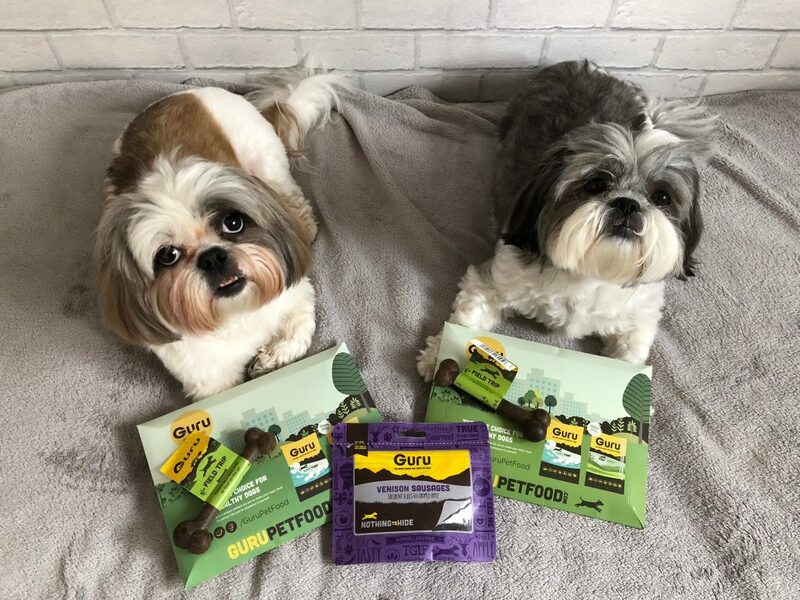 I can't thank Guru enough for sending out their range of delicious snacks for Pixie and Roxy to try. What I will say at this point is that Pixie and Roxy faces were in the box more than what my hands were, they sneaked a peek before I could. Before I go on with this review lets look at what Guru is all about. Lisa and Andrew and the owners of Guru they learned that cold pressing food was the best way to make a complete pet food. The food is carefully mixed at temperatures up to 44 degrees before it’s pressed for a second. This means the ingredients retain much more of their natural nutrients. It is a unique method and is the main difference between their food compared to extrusion which uses high temperatures and pressures. 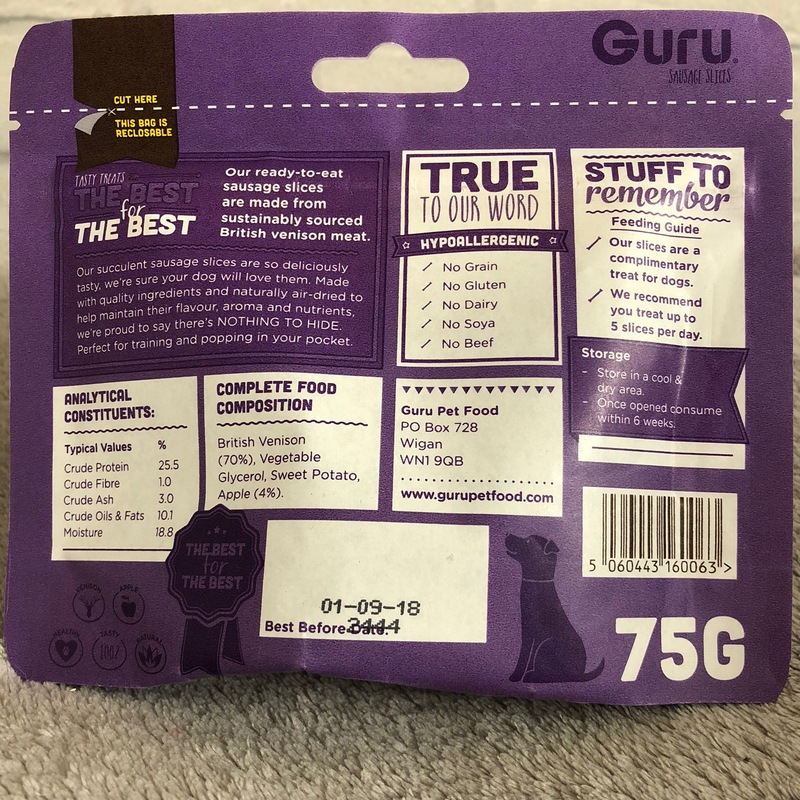 Guru have two flavours Surf & Turf which contains beef, sea fish and vegetables, the other flavour is grain free and is called Full On Feast this has duck, sea fish and vegetables. 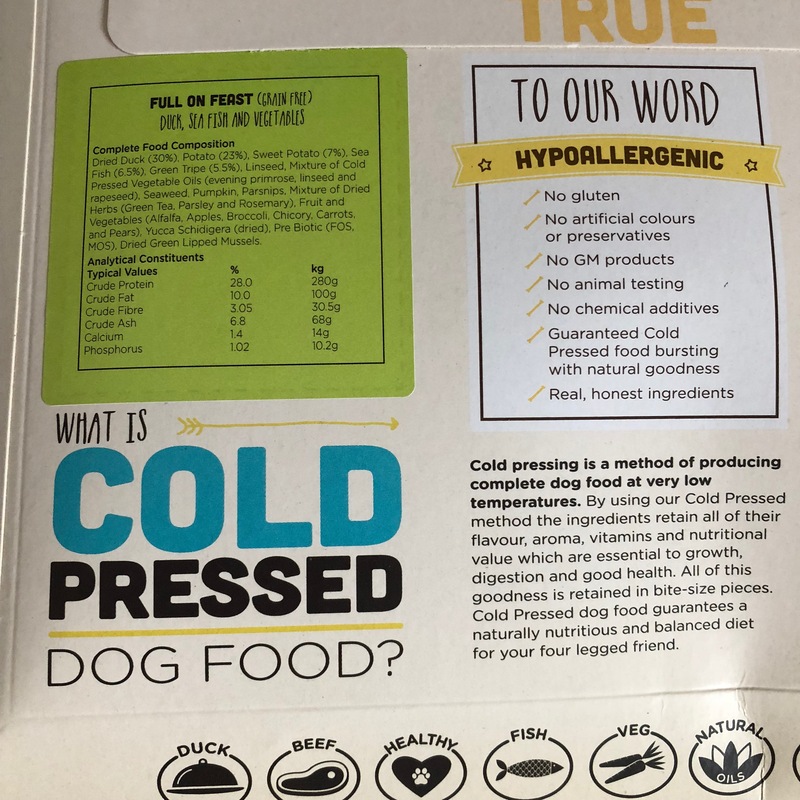 Both foods have no gluten, no artificial colours or preservatives, no GM products, no animal testing, chemicals additives, it is guaranteed cold pressed food bursting with goodness and has real honest ingredients. When I opened the packets Pixie and Roxy got really excited. It smelled really good, healthy and looked great. Reminded me of horse pellets. The taste test went really well. Roxy just got tucked into the Surf & Turf then decided to eat the Full On Feast. She loved both as did Pixie, she seemed to alternate between the two of them but Surf & Turf was the first choice. You can see their reaction on our youtube channel but I will have the video linked a the end of this blog post so you can check it out. Roxy loved it that much that she even sneaked a few extra from the envelope, she is a cheeky monkey! We gave some for dinner that night and again for their breakfast the next day along with their normal food. Safe to say it was Pixie and Roxy approved. 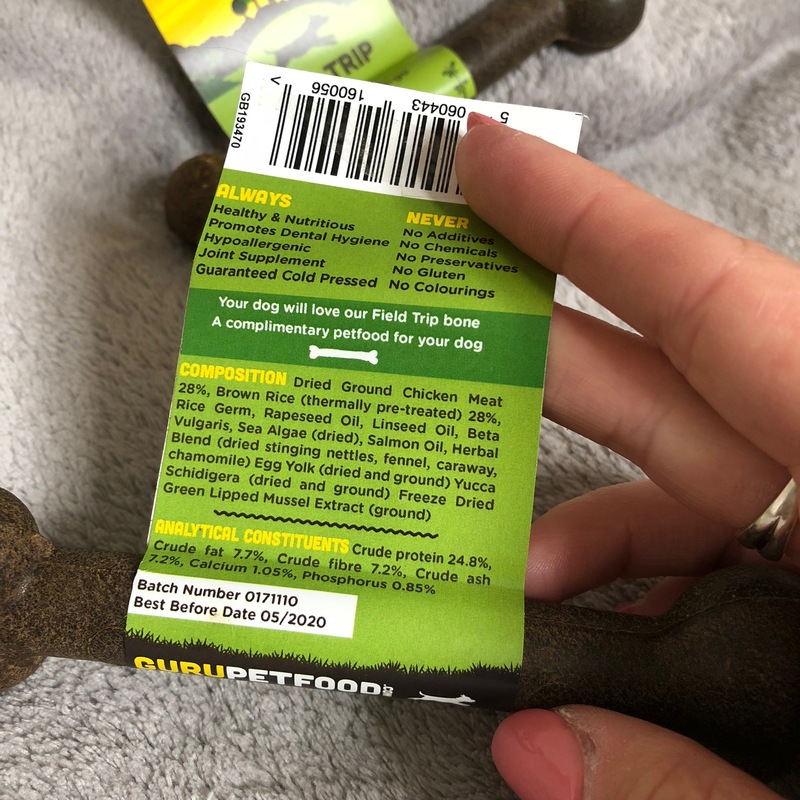 The only downfall to this food is that it does not have Glucosamine, Chondroitin and MSM in it which is what their current food has at the moment so if we were to change then we would lose this joint care supplement. Guru does have green lipid mussel in it so it has some joint care. Given that Roxy has her problems with her joints I am glad it has some joint care in it. Something I will need to consider if I was to change. I weighed out how much they usually get in their current food and weighed the same out with Guru and could not believe the difference in the amount Guru looked a lot less than what AATU looked like. 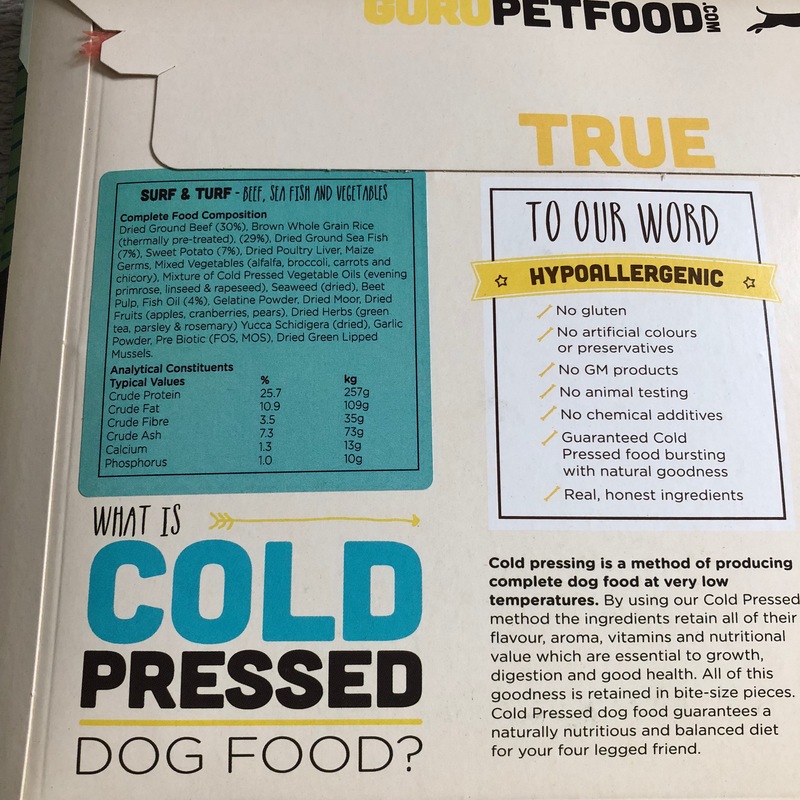 The Guru cold pressed food is heavier so looks less in the bowl and due to it being cold pressed you feed a less amount than regular food. It must have so much goodness in one bite. 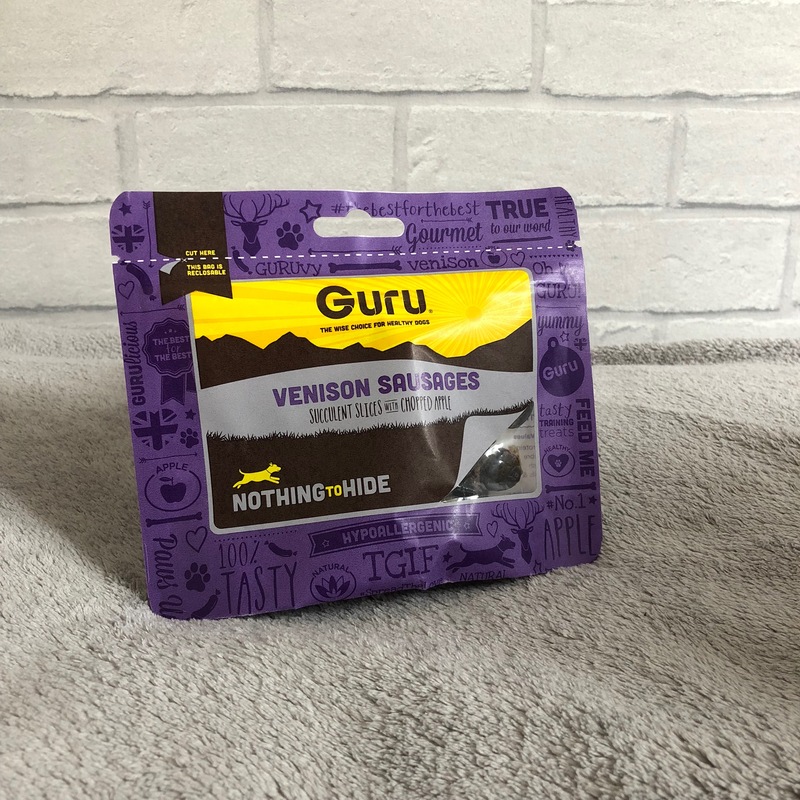 These succulent slices of venison sausages with chopped apple have absolutely nothing to hide with just 70% British Venison, Vegetable Glycerol, Sweet Potato and Apple 4%. They are already chopped into slices and are a good size for training treats. They have no grain, gluten, dairy, soya or beef. These are perfect for popping into your pocket and taking out for training or a snack in the park. These were Pixie and Roxy approved. Venison is something they do not get very often as we have had a few tummy upsets. I think it depends what treat it is, but so far so good with these treats. These healthy and nutritious bones are just amazing! They are the perfect size for Pixie and Roxy and contain a lot of goodness. These field trip bones are perfect for a tasty treat or food on the go, you can even snap them in half. 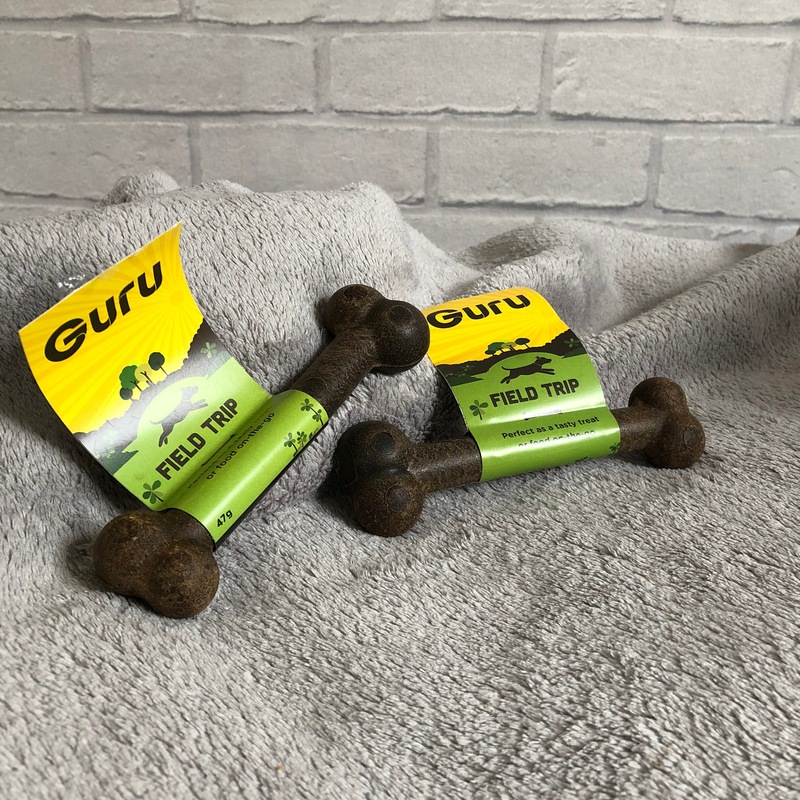 Guru also have a bigger size available to buy if you have a larger breed dog. They are 47g of tastiness and help promote dental hygiene, it is guaranteed cold pressed as well as being hypoallergenic and a joint supplement. I like what I see and so do Pixie and Roxy. So much so that Pixie refused to let go of the bone after getting a picture for this blog post, again you will see this in the video that we have done. This is one of the reasons why we do not give her stuff like this because she just refuses to let go and then rushes it and can choke, but these seem crunchy enough that that may not happen so we are going to give them a go. They smell great and of course, Pixie and Roxy approved. Pixie and Roxy certainly didn't want to let go of these and wanted me to order more. So was this tasty food and treats Pixie and Roxy approved? I think you can tell by the pictures and if you watch our review video then you will have your answer. 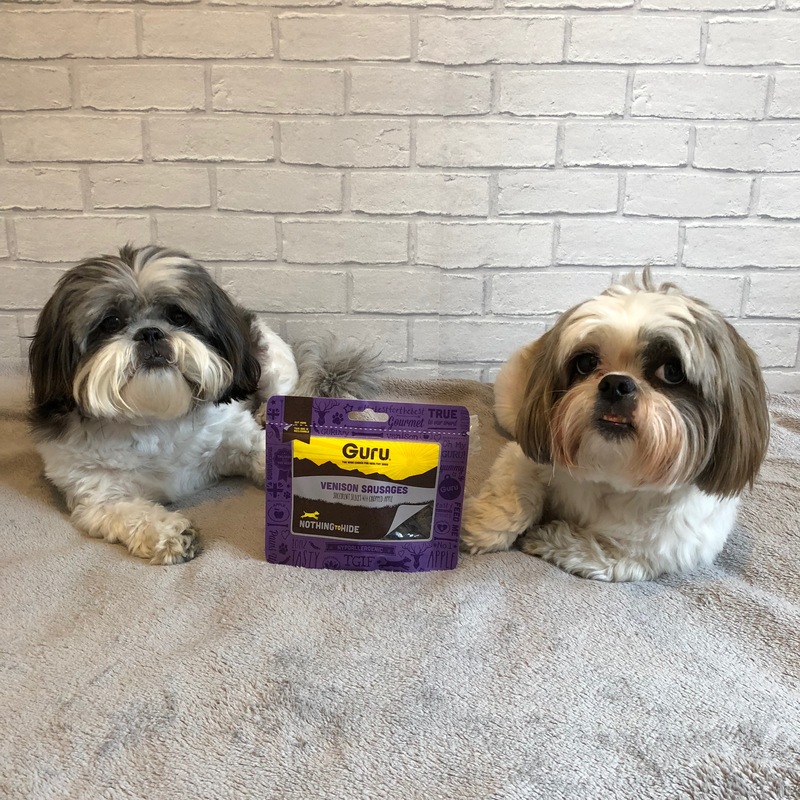 Pixie and Roxy love this brand and found it "gurulicious". I like how healthy the ingredients are and it contains green lipid mussels. It is gentle on the digestive system and also retains the flavour because it is cold pressed. Something I never mentioned before was that you don't need to have it dry. You can also add water to it and make it more like a wet food. We haven't tried it this way but I am guessing it makes the flavours stand out more. Compared to AATU I think it is more cost effective to buy Guru. I spend £60 every 2 months and that is for a 10kg bag of food. With Guru I would be spending £60 every 2 and a half months and that would be for a 14kg bag. I think it will last me this long, I have never had a 14kg bag of food before. 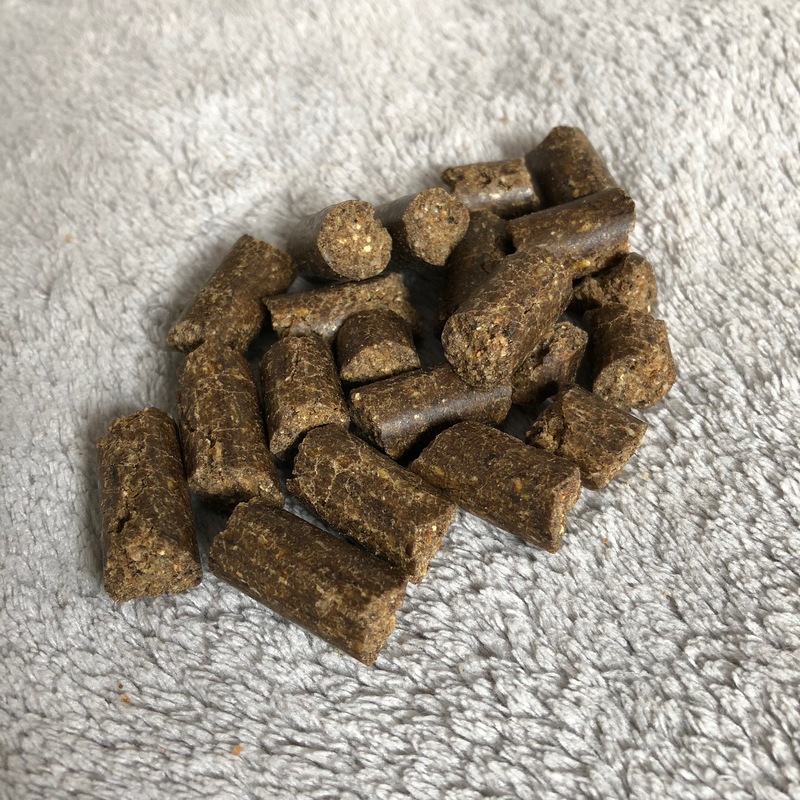 You are supposed to feed 1/3 less than regular food as this kibble is a lot denser and means that the bag will last you a little longer. All About Dog Food have rated this food 4.9 out of 5 you can also read others comments and their stories on this brand. As for me I love it and have already placed an order for Pixie and Roxy. I cannot wait to get them on this food properly. I hope you enjoyed reading this review and head to their website and give it a go. I hope your dogs love it as much as Pixie and Roxy do. Check our Pixie and Roxys reaction to the taste test. Wow… such a fantastic blog! Thanks for taste testing our cold pressed food Pixie & Roxy, we can’t ask for more than two ‘Paws of Approval’. Thank you so much for having such a great brand. We look forward to having Pixie and Roxy on your food long term.